New York’s new ferry is bad for transportation but a very guilty pleasure. New York’s new ferry system is a horrible transit investment—and a guilty pleasure. Henry rides the New York City Rockaway ferry route on its first day Monday. To understand the appeal of New York City’s Rockaway Ferry, try getting to its landing, which floats behind a giant water-treatment plant on a desolate stretch of Beach Channel Drive in the Rockaways, Queens’ beach-fronted peninsula of bungalows and housing projects. Riding an outbound subway train toward the beach on Monday morning, I passed crowded 7 a.m. platforms and spent 15 minutes waiting on a transfer. The best advertisement for the ferry, the city’s latest transit option, might be its sputtering subway system. The trip to Wall Street on New York City’s publicly subsidized ferry service—which launched on Monday morning—is a world away. There were seats to spare in the airy main cabin where passengers celebrated the debut with free coffee and donuts. For $2.75, we skimmed across a glassy Atlantic Ocean, around Coney Island, through the Narrows, and into the East River in a little under an hour. This, Mayor Bill de Blasio has promised, is the beginning of a new era in New York City—a return to the water that will relieve congestion on the city’s roadways and railways. In fact, each ferry fits fewer people than a single subway car. 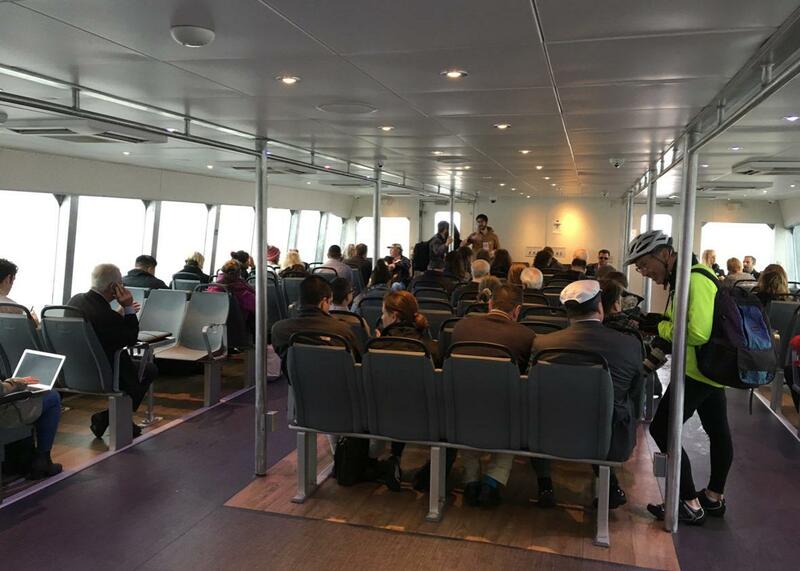 The idea advanced by James Patchett, president of the New York City Economic Development Corporation, that these ferries could function as a substitute for the subway is ludicrous. The first half-dozen ferries carried 700 people from Rockaway and Sunset Park to Lower Manhattan, not even one subway train worth of people. The truth is that the construction of the subways drove New York’s ferries out of business a century ago. That they have returned is a sign of a city that sees transportation as a tool to advance interests in politics and real estate—not to help people get around. There simply aren’t that many people who live and work on the waterfront, and therefore, no way that boats can meaningfully impact congestion. And yet, it must be said: What a lovely ride it was. With his ferry network, wannabe populist De Blasio has given the handful of New Yorkers who do live and work on the waterfront a real luxury amenity. Yes, the public subsidy is enormous. Yes, the ridership is limited. Yes, there were some hiccups on opening day. But for the handful of people who can structure their lives around these routes, the commute will be a real delight. It was easy to see the appeal for the dozens of Rockaway residents who were heading to 9 a.m. jobs in Lower Manhattan. Like everyone else in this city, they always feel like they’ve gotten the short end of the stick. De Blasio used to get booed out here regularly, in part because he shut down the ferry service set up after Superstorm Sandy. Some riders remember the date of the last ride: Oct. 31, 2014. The fare was $2; the city paid another $30 per rider in subsidy. The 8:30 boat on Monday morning was a bit of a special occasion. Gemma Mozeak, of Jamaica, had driven out to Rockaway with her son Alex, who works at a law firm downtown. For her, it was a proud moment for Queens and the Rockaways, and a reminder that New York was an ocean city. Other commuters drew a contrast with the subway. The ferry, they said, was civilized; the subway was full of “wild animals.” You’d get your face slashed on that thing, they warned. You’d need a Glock and a Taser to ride through East New York. 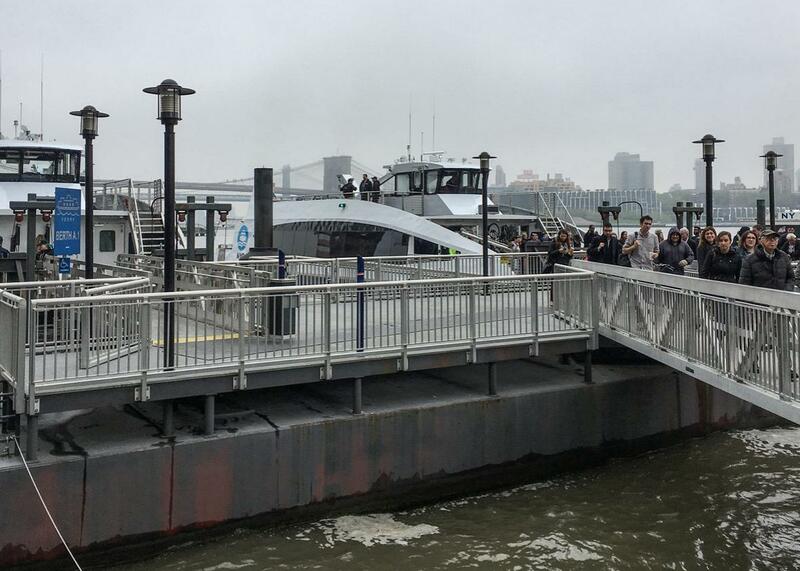 Passengers ride the new citywide NYC ferry service on Monday. I arrived in Manhattan with a feeling of thrill and loathing. On the one hand, how delightful to travel through New York Harbor in a seat by the window, with a laptop connected to Wi-Fi, and a hot coffee on the table in front of me. On the other hand, how shocking to see so much public money and initiative expended for the benefit of so few. Why? It’s partly an economic development strategy to encourage waterfront construction. It’s partly for leisure travel, which includes both tourists and New Yorkers—it’s hard to beat the views from the East River Ferry on a summer afternoon. It’s partly because ferry infrastructure can be deployed quickly. (Says it right there on the box: “Ready in just one mayoral term!”) And it’s partly that, since New York State retains control of the city’s real transit infrastructure (buses, subways, and trains), the mayor funnels his transit ambitions into toys like ferries and streetcars. Our boat, unlike the earlier trips Monday morning, did not get a welcome from Hizzoner on Wall Street. But I did run into Terry MacRae, the chairman and CEO of Hornblower, the company that runs the ferries. MacRae had been up since 3 a.m., surveying the scene as commuters walked up the gangway. Stylish, for sure. Transportation? Only for a lucky few.